When I was in second grade I won a writing competition in our school district, and the award was a paperback of Grimm Brothers fairy tale collection translated into Chinese. I finished the book in a day, and read it over and over in the following months and years, till it fell apart. It was my first contact with western literature. I learned English in school (grammars, vocabulary, lots of studying for tests), and read the "fun" books on my own -- Tom Sawyer (elementary school), Treasure Island (middle school), Jane Austin (high school), Shakespeare (college). Lots of books were in Chinese, and lots more in English, some were read in both languages so I could compare the translations. After Henry was born, I caught up on traditional children's books with him, from Good Night Moon, to Captain Nemo. So when Audry told me about her idea of designing knitting patterns from classic children's books, I was intrigued. 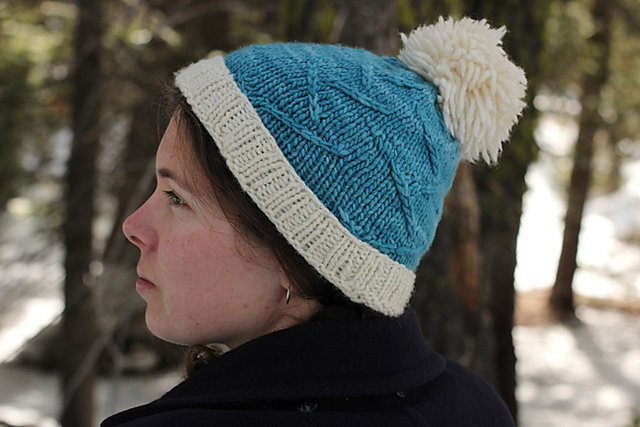 For those who don't know, Audry Nicklin, design name and Ravelry name Bear Ears, was the designer of popular pattern Celectarium, published by Twist Collective. During the past few months I have seen different versions of test knitting done by Green Planet Yarn staffers and Audry's friends. I couldn't wait to see the book in its full glory. Now here it is. I was one of the first lucky ones to see the print version. 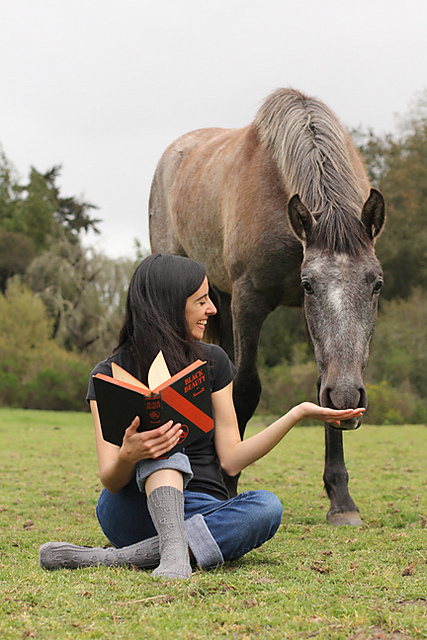 Audry put in meticulous work in every aspect of the book, from every chart, every picture, every diagram, to the overall design and print quality. Audry has the intuitive understanding of great literature, the artistic eye for visual and physical designs, technical skills in photography, not to mention maturity and self discipline for execution. Knitting world should watch out for the next Ysolda Teague, Cookie A., Susanna IC, Stephen West, Jared Flood, because she's coming, and her name is Audry Nicklin. Down The Rabbit Hole. 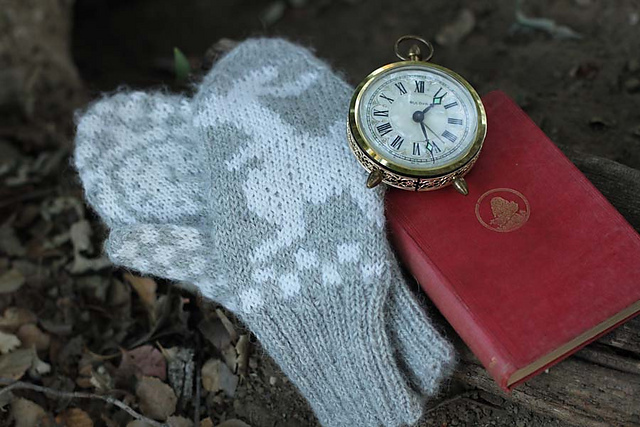 Inspired by Aice in Wonderland, stranded mittens with bunny on the back of right hand and clock in the palm of the left. Brinker, look at those skate tracks! I wasn't familiar with the book (Hans Brinker or The Silver Skates), but once I got the idea, I have to admire how Audry came up with the stitch pattern to illustrate the skate tracks. Be sure to go to her blog to see the video of her photo shoot in the snow. Deep Sea Wonderer. Can you imagine Captain Nemo wearing this cowl under the sea? I love the stitch pattern for the seaweed, might just have to do something with it! Tomfoolery. 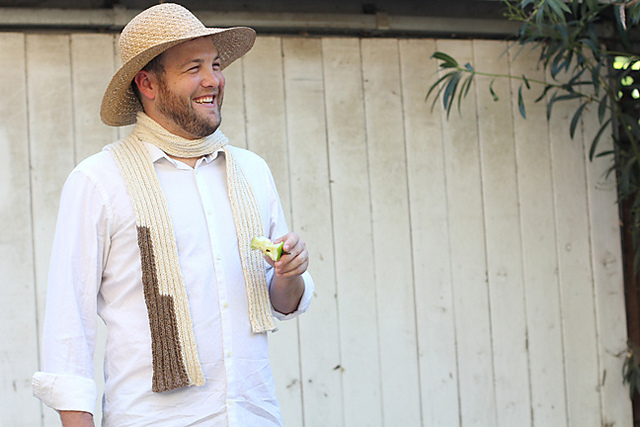 Two toned scarf to honor Tom Sawyer's fence painting (or rather, Tom Sawyer's outsourced fence painting) adventure. A very unique idea for a simple project, every boy, or girl, should have one of these. Black Beauty Rides On. The name of the pattern says it all. The recommended yarn, Frog Tree Pediboo, is the same as what I used for Snow White cardigan, only I used the worsted weight version for the sweater. Sail to Treasure Island. This is one of my favorite patterns in the book, a square blanket knitted center out, with lots of cables and lace. 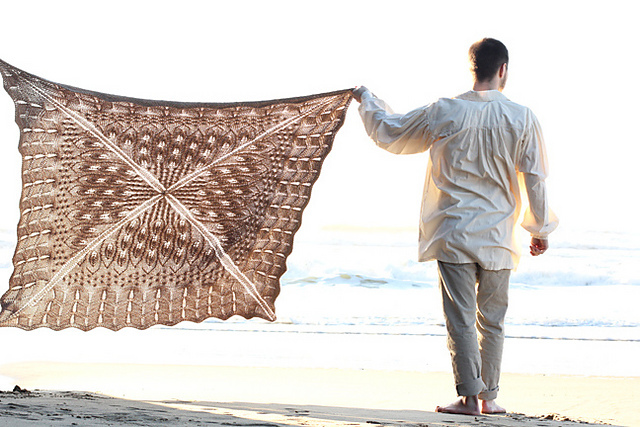 The charted pattern is for a quarter of the blanket, so it can be easily converted to a triangle shawl by knitting one or two or three sections (I guess three sections wouldn't make a triangle, but you get the idea). Robin Hoodie. My favorite! And it's full of cables! I think it's more than just my favorite, that's why it's on the cover of the book. This is a must-make for me. It's square and comfy, should keep me nice and warm on the coldest days of California winter, especially with the hood and I'm not usually a hoodie kind of person. Avonlea, what a sweet shawl that fits a girl's imagination. If I have a daughter this is what I want her to look like. Motoring Madness. Have I mentioned I love cables? 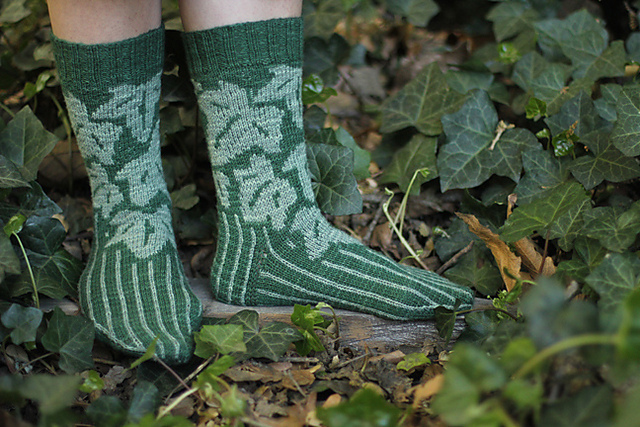 These irregular cables catch my eyes and I might just have to make a pair. Behind the Garden Wall. I need two pictures for this pattern because I have to show you the hidden key on the bottom of the foot. If a designer thinks about the bottom of your foot, she really has thought of everything. Now if you make these, make sure you have a pair of good slip on shoes, because you will want to lift your foot up in the middle of a conversation and say "Have I showed you my hidden key?" 5. Hop over to My Sister's Knitter on Sept 8 for the next stop of Lit Knit blog tour! 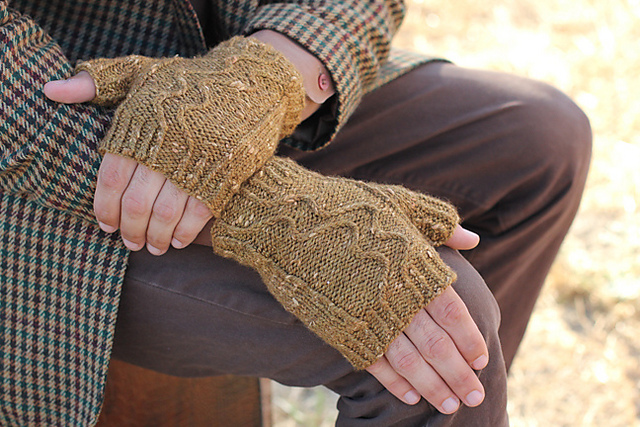 I really like the motoring madness mitts. Those are fabulous patterns. I am in love with the hidden key socks. The Behind the Garden Wall Socks are AMAZING! I love children's literature; what a brilliant idea for a book of patterns! I love "Sail to Treasure Island." Actually, there are a lot of nice patterns in that book. I'm a sucker for hoodies. I really love this book, and the favorite of all for me is Sail to Treasure Island. Sail to Treasure Island is becoming more solidly my favorite as I see more and more about The Book. It is faboo. 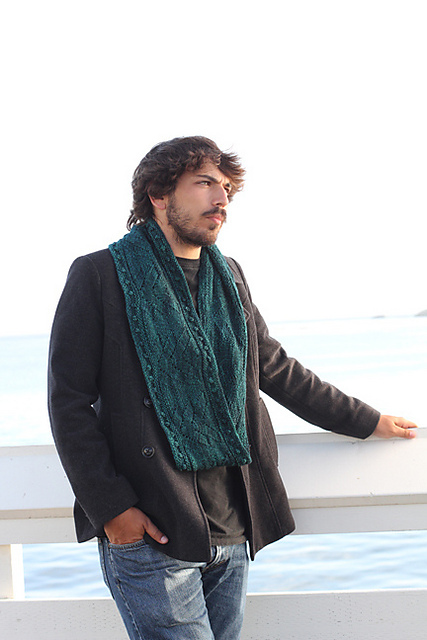 The Avonlea shawl is my favourite- lots of fond memories! The other patterns are great too, I think I'd knit t hem all. Thanks for a chance to win! 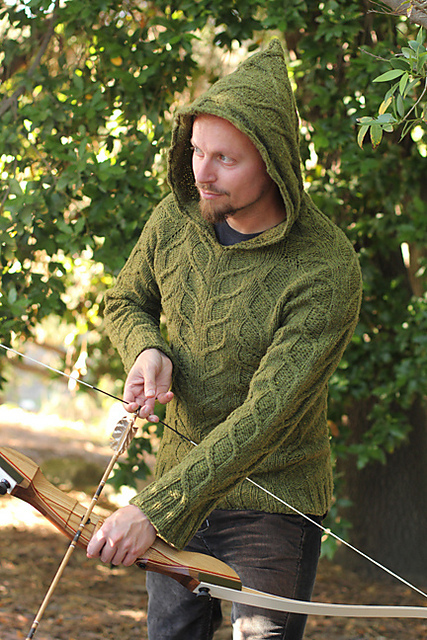 I really like the Robin Hood hoodie. The cables are stunning! Oh my gosh, how do you pick just one favorite?? 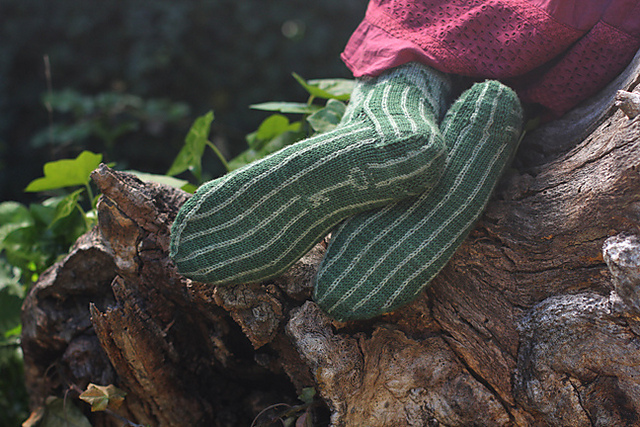 I love the hoodie, the secret key socks, the mitts... love! My favorite is also Robin Hoodie. Although is is modelled by a man, I would definitely make it for myself. I will definitely be knitting Avonlea. I'm bigblueice on Ravelry. Thank you for hosting! Definitely Treasure Island. Its gorgeous!! I love Sail to Treasure Island. I too am completely smitten with the Robin Hoodie! Just thrilled to win this book- it is fantastic! Thank you so much for hosting the give away, and to Audry for offering the prize!